IB MYP Community Project season is upon us at my campus so I have created a ThingLink interactive image to help students select their project topics and develop their action plans. For those of you who are unfamiliar with the MYP, the Community Project is the culminating event of the MYP for programmes concluding in Year 3 (8th grade for my school). This project requires students to engage in service learning through direct service, indirect service, advocacy, or research; the process aligns with Catheryn Berger Kaye’s five stages of service learning. The image is currently “on display” in my library on the Boxlight 84’’ Interactive Flat Panel screen. This screen is enormous, and the students absolutely LOVE it. Even the most basic tasks, such as searching the online catalog (which is available on FOUR dedicated desktop computers every single day), have students clamoring for a turn. It’s a great tool for engaging students due to its size and interactive capabilities. Of course, if you don’t have a giant touchscreen, the interactive image also works on tablet devices, phones, and laptops/PCs. I have a ThingLink Premium Plan for Education (Teacher) which I purchased for a reasonable annual fee, but ThingLink also offers a free version that is quite useful. I encourage you to create a few images to see how you like it before purchasing a subscription; I have used it several times with students and regularly post images on the interactive screen. When selecting resources for this interactive display, I chose to focus on individual stories and/or the process of service learning (action) rather than the more academic texts that will be useful as students further investigate their chosen topic. I wanted to provide a selection of engaging books and inspiring role models to excite students about the project. Titles like Get Real or Your Water Footprint are certainly topic based, but they have lots of facts and figures presented in an easy to read manner, often through graphics, making the titles accessible to our reluctant readers. 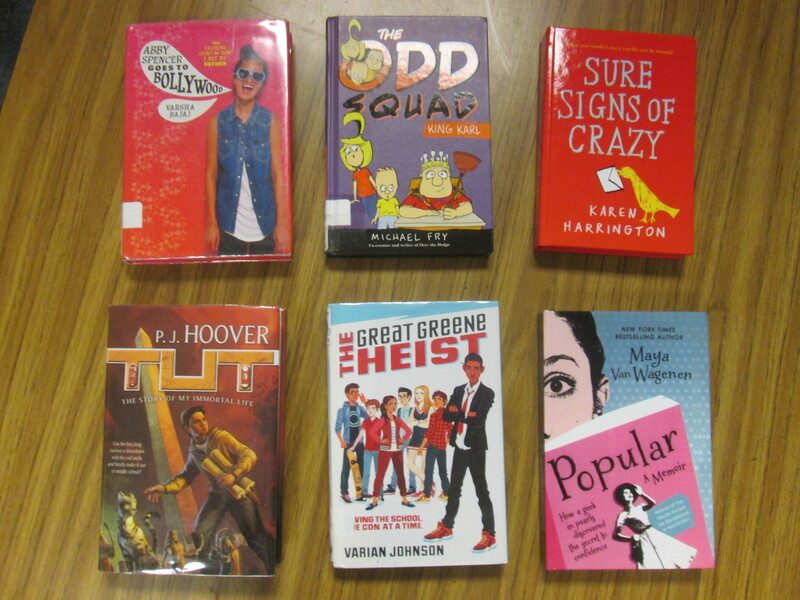 I also selected titles that my library owns (or can be accessed electronically) so that students can use the resources immediately. I think that some of our students, especially those who are reluctant readers or who don’t tend to be intrinsically motivated about school projects, will benefit greatly from the overview the display provides. While not as beneficial as reading one (or more) of the books, the videos and web resources on the interactive image will also provide a platform for independent investigation for those who struggle with the research process. As you know, I believe that learning is always an adventure, and the Community Project offers our students a chance to explore a community of their choice (their neighborhood, and orphanage in Africa, a school campus, etc.) and design a way to make it better. Some projects will have an enormous impact and may very well change the way we live each day while others may only impact one or two people. Either way, the process empowers students to set attainable goals and work to positively impact their world, not just in 8th grade, but for their entire lives – an extraordinary adventure. Brian, S. J. (2014). Bullied by Her Best Friend. (cover story). Scholastic Action, 37(9), 4. 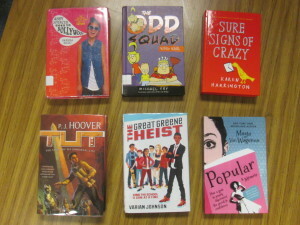 A selection of books by authors from the 2015 Spirit of Texas Reading Program Middle School List. If you are not familiar with the Spirit of Texas Reading Program (SPOT), I highly encourage you to check out the program webpage for an array of creative programming resources, even if you are not from Texas. The program selects six authors annually at the middle school and high school level who are either from Texas, have lived in Texas, or write about Texas or Texans. While the relationship with Texas determines an author’s eligibility for the list, the lessons, resources, and activities do not necessarily relate to Texas and thus are a treasure trove for any librarian looking for engaging programming. As a member of the Spirit of Texas Middle School Committee, I can assure you that we work hard to provide a thorough resource package for each of the authors on the list including a passive program (one that it’s easy for students to do independently), an active program (like a library party or event), and a school program (linked to the Texas Essential Knowledge and Skills – TEKS – for a variety of subject areas). Again, all of the lessons and activities could easily be modified for libraries outside of Texas. You will also find book trailers, author videos and extensive resource lists/read-alike suggestions. The programming from past years is also available. It’s an outstanding resource for any librarian looking for some inspiration and tools to introduce students to new books and authors and I highly recommend it. The Spirit of Texas Reading Program is a part of the Texas Library Association Young Adult Round Table. I am currently serving on the SPOT Middle School Committee. The World is Waiting for You… and Me! Or, my philosophy of education. When considering my philosophy of teaching and learning, I immediately think of the IB Learner Profile. Teachers have the ability to change the world through the lives of the students they teach. This is not only an enormous responsibility, but also a tremendous honor. As educators, we must consistently model the attributes in order to instill them in our students and ensure they become responsible participants in the global community. 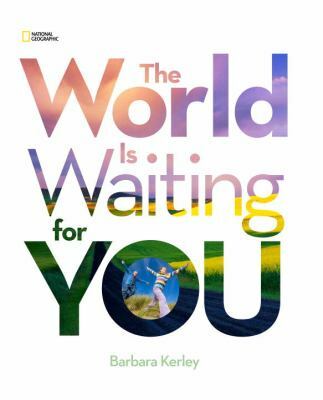 This philosophy is summarized nicely in Barbara Kerley’s highly acclaimed picture book The World is Waiting for You. Kerley’s photojournalistic style engages readers with limited text and brilliant pictures. It is through these vibrant photographs that she tells the story (which mirrors my teaching philosophy) that one must get out into the world and “Sift. Scrape…get your hands dirty,” in order to truly become an engaged learner (2013). The pages are filled with inquirers begging questions like “What’s waiting?” around a corner, on the other side of the mountain, or at the end of a long road. Risk-takers make the decision to “Poke around for a while… [and] See where the river takes [them]” as the underlying message permeates the text: hard work will pay off in time, though challenges will present themselves on the journey (2013). In each picture, children and adults are active, messy, adventurous, and experiencing the wonders the world has to offer. Not one of them is sitting in a desk, or even in a classroom. This array of rich experiences is the link between Kerley’s perspective and my philosophy. Learning happens as we explore relevant questions and seek out their answers, preferably in a hands-on manner. In order to be an effective educator, I must demonstrate these attributes and serve as an example for lifelong learning. Students must see me act in a principled fashion, and respect the knowledge and wealth of experiences I bring to the lesson. As reflective learners, my students and I learn together, and evaluate our successes while also understanding that one cannot truly learn without first meeting failure. This failure is not in the sense of earning a grade, but as a part of the design process; we investigate, evaluate and re-design until we reach a conclusion or find a solution to the problem. Finally, I believe that teachers must have a passion for both their subject and the learning process. I embrace education with enthusiasm in both my innovative lesson design, and my ability to create enriching interdisciplinary experiences. Learners must have ownership in their learning and the interdisciplinary platform provides an opportunity for all subject areas to work together in order to form a larger, global, understanding. While it is important for me to share my passion with my students, it is also important for me to serve as a campus leader and engage others in the ongoing inquiry process. Kerley, Barbara. The World Is Waiting for You. Washington, DC: National Geographic, 2013. Print. FTC Disclaimer: I own a self-purchased copy of this book and chose to review it without compensation from the publisher; all of my reviews reflect my personal opinion.